what is osgood schlatters disease ? Osgood Schlatter Disease is most commonly characterized by the big tibial tubercle and pain on activities like kneeling or repeated jumping. OSD arises from a strong pull of the quadriceps muscle on the tibial tubercle during a child’s growth spurt. This normally occurs around the ages of 9 – 16 years old. This strong pull occurs in sports that require a quick, strong contraction of the quadriceps, like in soccer, martial arts, and basketball. The quick, strong pull on the tibial tubercle has an avulsion-fracture like effect (when a small bone fragment breaks away from the main bone mass) that would cause an inflammation of the periostium. However, with the child being actively involved with the sport, this effect is magnified as the action is repeated. The frequency and repetitive nature of the sport doesn’t allow the periostium to recover and thus causes a chronic inflammation on the prominence of the tubercle (see image). This leads to a constant, persistent pain, especially on impact. This pain will not only limit the child’s performance in the sport, preventing them from excelling, it would also cause a lot of inconveniences later on in their growing years. Osteochondrosis of the tibial tubercle was first recognized in the early 1900s. Two separate clinicians reported on a phenomenon in which active adolescents were complaining of pain with running and jumping centered over their tibial tubercle. Both Osgood and Schlatter were credited with identifying this condition and thus were attached to its title. They described the disease as occurring in children who are undergoing rapid growth who place stress on the developing tubercle through patellar tendon force. Through this force, others theorized that the maturing tubercle is partially or completely avulsed. The authors distinguished this entity from a tibial tubercle avulsion fracture and stressed that the condition is due to repetitive loading of the area. This is the classic description of traction apophysitis. Osgood Schlatter disease was originally reported to be found more often in boys than in girls. With the increasing number of young female athletes, the condition is now being seen at a similar rate to young males. Young girls present with symptoms earlier, between the ages of 10 and 13 years, as opposed to the boys, who develop the condition between the ages of 12 and 14 years. The prevalence of Osgood Schlatter disease was reportedly 21% of a group of athletic adolescents, compared with only 4.5% of nonathletic individuals. Running, basketball, and hockey are the most common sports in which boys develop symptoms, whereas gymnastics, volleyball, and figure skating are the most common for girls. The disease is found bilaterally in 20% to 30% of individuals. Often, enlargement of the tibial tubercle is found from repeated repair attempts. Ehrenborg described four stages of development of the tibial tubercle: the cartilaginous, apophyseal, epiphyseal, and bony stages, in that order. The cartilaginous stage- is from birth to 8 to 10 years of age and consists of a cartilaginous tongue-like mass. The apophysealstage- begins when one or more centers of ossification are identified in the tibial tuberosity. The epiphyseal stage- quickly follows and is heralded when the ossification center from the proximal tibia and tibial tuberosity coalesce. The bony stage- is seen when the closure of the physis of the tuberosity is complete. Ehrenborg believed that Osgood Schlatter disease results from repetitive traumatic avulsion of the patellar tendon from the tibial tubercle. The condition is universally found in adolescents who are undergoing a rapid period of growth. During this time, an imbalance of growth between the bone and the muscle unit may lead to a decrease in overall flexibility. 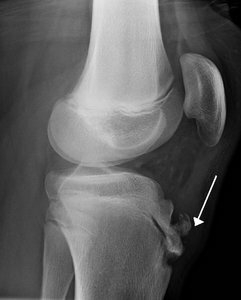 Patella alta (patella alta refers to an abnormally high patella in relation to femur) has been associated with Osgood Schlatter disease, but no definitive predisposition has been established. The patellar angle is the angle between the articular surface and the inferior pole of the patella. Individuals with the condition showed a smaller patellar angle, which the authors associated with a need for greater quadriceps force to perform similar activities as others. Repetitive microtrauma has been seen as an integral part of the disease process because individuals who are not active develop the condition at an exponentially lower rate. The clinical presentation of Osgood Schlatter disease is straight forward. Patients complain of activity-related pain focused over the tibial tubercle and distal patellar tendon. With questioning, adolescents will report discomfort that worsens with running, jumping, or kneeling. Typically, patients will not halt their activities because of discomfort. The history may include a gradual onset of pain that is accompanied by swelling over the area. Basketball, volleyball, gymnastics, and soccer are often the activities associated with this syndrome. The common threads in these activities include running and jumping that loads the knee in flexion, leading to an eccentric quadriceps contraction. Tenderness, swelling, and prominence of the tibial tubercle are often found on physical examination. Patients may walk with an antalgic gait, which is often noticed by the parent rather than the individual. The tendon may also show tenderness with palpation primarily in the distal half. Bone irregularities are often palpated in chronic situations. Acute cases may present with an extensor lag, confusing the diagnosis and raising concern for a tibial avulsion fracture. 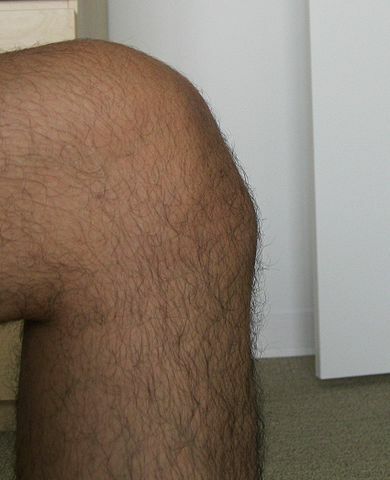 Passive range of motion of the knee is full, and knee effusions are not seen. Quadriceps and hamstring tightnessis not uncommon. The apophysis can show separation or fragmentation of the tibial tubercle in the Osgood Schlatter patient. Enlargement of the tubercle may also be seen. Soft tissue swelling can also be appreciated along with thickening of the patellar tendon. More important, radiographs assist in excluding unlikely diagnoses such as neoplasm or infection. Because of the high level of operator dependence, this modality is not widely recommended. MRI- is appropriate for cases in which the extent of soft tissue swelling or tubercle prominence is unusual. Hirano and colleagues evaluated the progression of Osgood Schlatter Disease with magnetic resonance imaging (MRI). They described five stages in the progression and resolution of this condition. The normal stage (1), with no MRI changes, was seen in the earliest of symptoms of Osgood-Schlatter, mild pain and minimal swelling. The early stage (2) showed low signal intensity at the secondary ossification center, which did not translate to changes on plain radiographs. Cartilaginous damage of the tibial tuberosity and tearing of the secondary ossification center with an open shell separation were seen in the progressive stage (3) on MRI. The knee in this stage also showed swelling at the insertion of the patellar tendon. The terminal stage (4) showed signs of healing and resolution of swelling. It was in this stage that ossicles were identified and pulled superiorly. The final stage (5), healing, showed almost normal radiographic findings with prominence of the tibial tubercle. Treatment is guided by the severity of symptoms. As evidenced by the natural history evaluations, this syndrome is generally a self-limited condition. Improvement can be gradual, which should be stressed to the patient and family. A period of 12 to18 months can pass before the complete resolution of symptoms. This correlates with the duration needed for closure of the epiphysis. The best way to prevent the onset of OSD is to ensure adequate stretching and good control of the quadriceps. Adequate prehab should thus be a key before starting any form of sport.